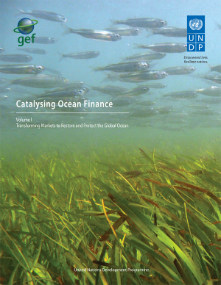 The United Nations Development Programme (UNDP) in collaboration with the Global Environment Facility (GEF) launched the book "CATALYSING OCEAN FINANCE" on 14th December 2012 in Washington D.C. Drawing on 20 years of research and experience, Catalysing Ocean Finance demonstrates in two volumes how a modest investment of public finance, in the order of $5 billion over the next 10-20 years, can scale up proven ocean planning and policy tools, leverage financial flows, transform ocean markets, and reverse the global decline in ocean health. This book demonstrates that, far from being an intractable problem, sustainable ocean management could become a successful legacy of today's generation of decision-makers. To illustrate the application of market transformation instruments to promote sustainable coastal and marine resource development, the book features six case studies, drawn from the portfolio of International Waters projects financially supported by the GEF and implemented by UNDP in 31 of the world’s most important trans¬boundary marine and freshwater ecosystems.. These six are: (i) Black Sea and the Danube River Basin; (ii) Yellow Sea Large Marine Ecosystem; (iii) Rio de la Plata and its Maritime Front; (iv) Seas of East Asia; (v) West and Central Pacific Fisheries; and (vi) Global Ballast Water Programme. The world's oceans are known to provide trillions of dollars in goods and services every year; however, many ocean ecosystems are in steep decline because of pollution, overexploitation, habitat loss, invasive species, and climate change. Without concerted near-term effort, the damage may become irreversible and consequently reverse the progress made so far in achieving sustainable development. Although not included in the book as case studies, in Africa, UNDP supports most of coastal states in sub-Saharan Africa whose economy and development depend upon fisheries and other marine resources. UNDP-GEF supports the following four (out of five) Large Marine Ecosystems (LMEs) along the African continent: Agulhas and Somali Current LMEs, Benguela Current LME, and Guinea Current LME. Strategic Action Programmes developed for each of those African LMEs will 1) promote key policy reforms, 2) strengthen joint management of the marine resources, and 3) catalyse and direct investments from both public and private. The next set of case studies for Catalyzing Ocean Finance will most likely be developed from the LMEs in Africa. 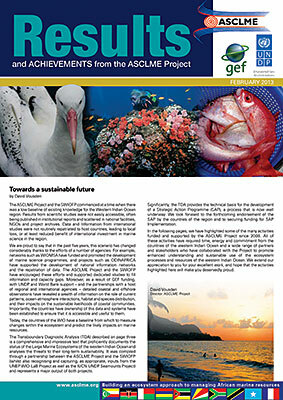 Members of the ASCLME Project are strongly encouraged to download the two volumes and consider how the "lessons learned" can be applied to implementing the joint ASCLME/SWIOFP Strategic Action Programme, and particularly, how long term sustainable partnerships can leverage continued support for SAP Implementation, both during a GEF-funded SAP Implementation Project and far beyond. The electronic version can be downloaded from the GEF website here. An overview of the book was given at the 6th Project Steering Committee Meeting in February 2013; the PDF of that presentation is available here. The UNDP supported GEF financed ASCLME Project is pleased to present our "Results and Achievements from the ASCLME Project" publication. The report is available as a downloadable PDF or in an e-reader format (full screen PDF) and highlights the work the Project has undertaken over the past five or so years, and the great advances made by the countries with the support of many project partners in implementing an ecosystem approach to managing African marine resources. Sister project SWIOFP has a similar publication which is available here, and provides more insights into how the two projects have worked together to achieve their goals. The publications are in both English and French.